Global chief executives are more pessimistic about growth than this time last year, according to a survey. Only 27% of interviewees thought growth would improve, against 37% in 2015, the report by consultants PwC showed. Business leaders are increasingly worried about geopolitical risks, as well as China's economic slowdown and the falling oil price. The findings chime with a report by International Monetary Fund report that downgraded global growth forecasts. The IMF said on Tuesday that it now predicts economic activity to expand by 3.4% this year, down from an estimate of 3.6% in October. PwC's survey, released ahead of the annual World Economic Forum, held at Davos, in the Swiss Alps, interviewed more than 1,400 chief executives across 83 countries. "There's no question that business leaders' confidence in both the global economy and their own company growth prospects has taken a knock," said Dennis Nally, global chairman of PwC. "No matter what the business size, the threats it faces are becoming more complex, crossing the borders of geopolitical, regulation, cyber security, societal developments, people and reputation." What is the 'resilience imperative'? In recent weeks, stock markets across the world have gone into reverse, fuelled in part by concerns about the economic damage that lower oil prices might do. Last week, energy consultancy Wood Mackenzie estimated that energy companies have shelved almost $400bn of spending on new oil and gas projects since the price of oil began tumbling about 18 months. There are also worries about the impact falling oil revenues for many emerging markets. And the continued slowdown in China's economy, underlined on Tuesday with publication of new data, has heightened fears that a key engine of global growth is stalling. However, business leaders remained relatively confident that they would continue to hire staff, particularly in the UK, where two-thirds expected to expand their workforce this year. Indeed, it is the ability to find skilled workers that is pre-occupying British bosses, the survey said. Those in charge of American companies were the least optimistic about growth, while those in India were most likely to be optimistic. This was put down to the positive business mood surrounding India's new prime minister, Narendra Modi. The other concern uniting leaders was the lack of trust in business, a much-discussed topic in Davos, with more than half citing it as a concern, compared to 37% just three years ago. "Re-shaping companies built on profit alone into ones where profit and purpose combine, is not going to happen quickly or easily, but it's a transformation that is already starting and that business need to keep pace with," said Mr Nally. 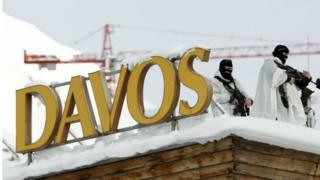 Video Davos: What does the 'resilience imperative' mean?